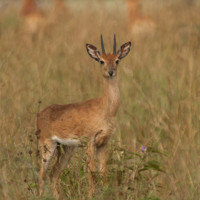 Adult male (with horns) and adult female oribi Ourebia ourebi aequatoria in Kidepo Valley National Park, north-eastern Uganda. of olive baboons Papio anubis crossing the Kidepo River near the South Sudan – Uganda border in Kidepo Valley National Park. Adult Clapperton’s francolin Francolinus clappertoni in Kidepo Valley National Park. In East Africa, this species is only found in north-eastern Uganda. Vervet monkey Chlorocebus pygerythrus east of Pian Upe Game Reserve, central east Uganda.